The discussion of the chemistry of life always leads up to bigger and more evident levels of biological concepts. Thanks to eons of emergent interactions between the elements of life–CHNOPS–, we have cells, the basic unit of life. And it took mankind more than 2,000 years to make the important breakthrough of discovering that all life is made out of cells. So, all matter is made out of atoms–and the interaction of its subatomic particles with other atoms–, and all life is made out of cells. Terry Winters, Double Gravity. 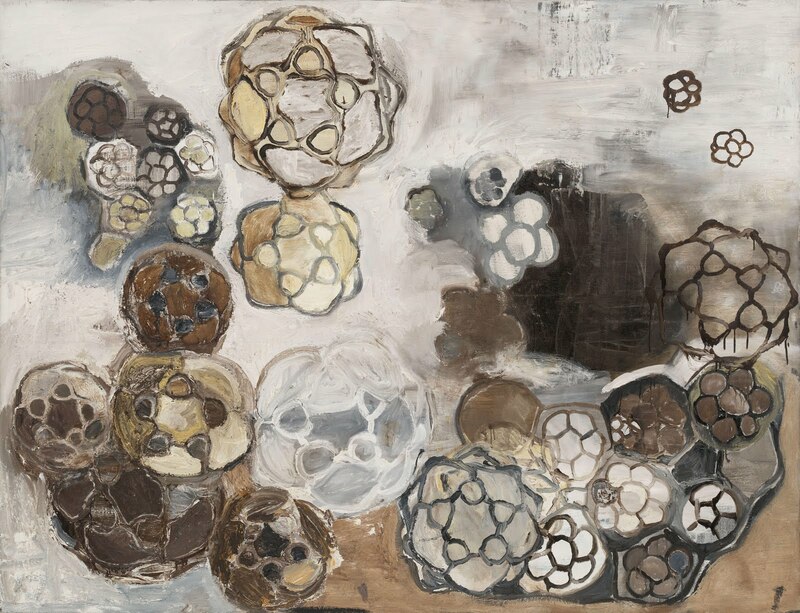 This piece resembles embryonic cells at different stages of development. 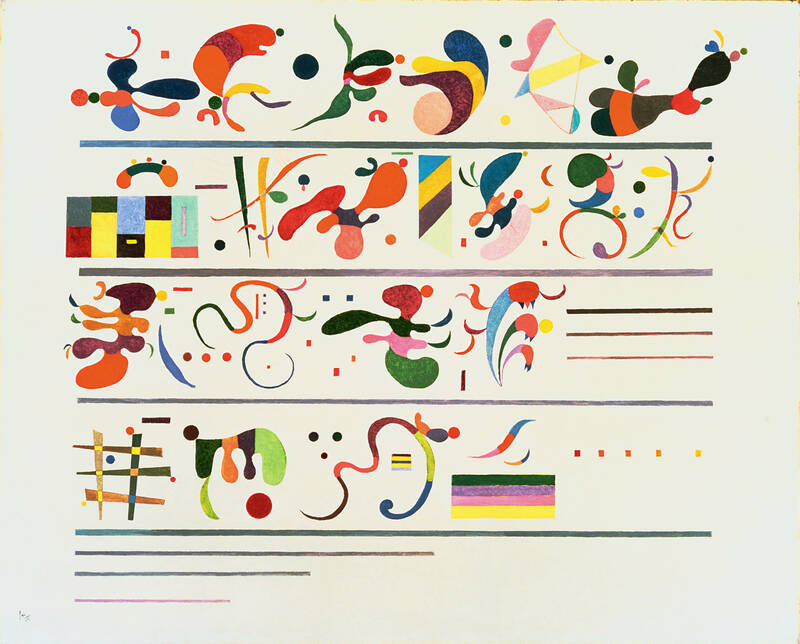 Wassily Kandinsky, Succession. Notice the emergent quality of the shapes–which resemble bacteria and organelles–, reminiscent of evolution. 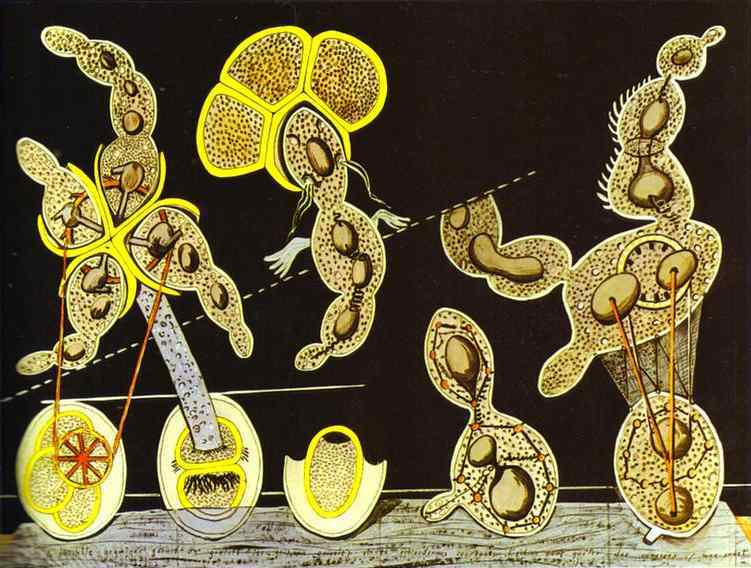 Max Ernst, The Gramineous Bicycle Garnished with Bells the Dappled Fire Damps and the Echinoderms Bending. This piece clearly suggest cell morphology. Activity — Enrichment of knowledge: Google the following concepts. These may be helpful when commenting on this blog post: ‘biomorphism’, ‘cell theory’, ’17th century textile industry’. Primary source: If you wold like to know more about the cross-disciplinary aspects of cell biology and art, you can click here: Images of the Cell in 20th Century Art and Science. This information may also prove useful when commenting on this blog post. This entry was tagged Art, Chapter 4: Cell Structure and Function, History, Unit II: The Cell. Bookmark the permalink. When we discussed this topic in class today, I was very surprised when it was mentioned that microscopes had not been invented to examine anything related to organisms or their structures, but to examine precious textiles that could have been forged during the 17th century. I wondered what Robert Hooke must have thought, seeing the cell for the first time, and what conclusions exactly he drew from his studies. I looked into what is now called the “cell theory”, and I discovered that Hooke had first described the tiny pores of the cell visible through the telescope as “the walled compartments a monk would live in”, an observation that ultimately gave the cell its name. You can read more about the cell theory, how it evolved, and about the findings of other scientists who dedicated their lives to studying this very topic in the provided link. Great link, Isabella. Notice that the discovery of the cell—as with any important discovery in science—was the result of the investigations and inquiries of many people. “We stand in the shoulders if giants” refers to scientific progress as the result of a community of researchers building upon works from the past. As I saw the explanation in class I wanted to know if art ever changed how scientists see scientific descoveries. Does art ever transform science or change experiments? A good scientist is a creative scientist. And a creative scientist is able to shuffle acquired knowledge in new and unexpected ways. This is the case of Albert Einstein, a theoretical physicist who was able to refute some of Isaac Newton’s most important claims thanks the the insight he got from plural, cultural interests—which include a passion for music. When I saw your reply about Albert Einstein I looked more into how he used art and science hand in hand. He used images to understand his problems and then found words to explain them. As he explained more carefully his idea, Albert Einstein said that he never thought of symbols or complex equations. In the link below you will find more information. When we discussed this topic in class I was astounded by the fact that people designed specific microorganisms through art in an accurate way. If it were not for Hooke, some of the advancements of the cell may have not been made without his discoveries. One way we can prove this is that Hooke developed a design of the cell using his observations and provided an accurate base of information of the cell which led to advancements and new discoveries in our generation and so on. In biomorphism we can see that the method of organic design and the art that Hooke developed through his observations are alike. Biomorphism focuses on the power of natural life and uses organic shapes with vague hints of the forms of biology. We could also say that somehow Hooke “started” this even though the movement became popular in the 20th century. Amazing link. And great comment, Ángel. The study of cells began about 330 years ago. Because of the cells small sizes, they escaped notice before that time. When the microscope was invented and some subsequent improvements, the cells became visible and many new discoveries were made about them. Everyday the study of cells reveals more detail, and its secrets, which are in fact the secrets of life itself, are revealed with ever increasing clarity. The cell is the basic unit structure of every living thing. Cells were discovered for the first time by Robert Hooke. The first person to see the living cell under a microscope was Anton Van Leeuwehoeke and named many living organisms in them. All organisms on Earth are made of cells and their products. Cells are the basic unit of life. Could you do a timeline of the evolution of life on Earth? How many billions of years elapsed before life actually appeared on Earth? It’s interesting to see how, in these times before, the relationship between art and science went hand in hand. You had to be able to execute your viewings or experiments in the most creative of ways and, evidently, made the scientific experience/result more efficient & evolutionized into the science we know today. Without these drawings, we probably wouldn’t have known some microscopic beings with the exactitude this art provided back then. I agree. Science and creativity go hand in hand. Art is the application of human creativity forming paintings, sculptures, etc. There are many types of expression but when art is mixec with science we can see the creative way an artist sees the scientific world. It is hard to imagine that without art we wouldn’t have many things that exist today, science wouldn’t have evolved the way it did. Our present lives are just a mixture of sicence and art. Scientists and artists share many traits: curiosity, good observation skills, creativity, and drive. Actually, everyone should have those skills. Everyone should have them but sadly not many people do. Scientists in the 17th century only had what ancient greeks and other people said but they did not have a true foundation for them to study. They had nothing to go on, thanks to them being jacks of all trades they knew about many things which included science and art, we have what these scientist discovered and researched so it makes our work easier but it made their work even more difficult but if not for them the world would have never advanced to the world we know today. Thanks to the renaissance the scientists were less specialized in other words they knew about many subjects which led to all that we know today such as chemistry, biology and , this topic, biomorphism which is art movement where people draw the nature patters or living organisms in different ways that they perceive them and allow these things to influence in not only drawings but architecture too. Present day we specialize more so we know less about the other things. What all this says to me is that: now a days is it more difficult to discover things because we are more specialized and less creative or easier because each individual knows more about their subject? After the 19th century, everything acquired a hectic and fast pace: agriculture, our daily lives, etc. Industrialization changed the way people live. Life expectancy of people after the 19th century almost doubled. And infant mortality decreased dramatically. So, a lot more people, living a lot longer… More food is needed, a lot of fossil fuels being burned… The result: people had to be ‘educated’–or more accurately: trained–to meet the increasingly pressing needs of the modern world. This means more specialization, especially in the areas that have to do a lot with technology and science. Back then, to be a scientist you had to have artistic capability in order to draw what you observed. Many people could argue that the scientist could have used another person to draw what they saw, but that person would have not been able to draw exactly what the scientist described to have seen. You could infer that to be a scientist back then, you had to have the complete package. It is sad to see that many artists have lost an appreciation for the science. That connection that was once needed to be a skill-full artist and a great scientist has been replaced by technology. The paintings of that era are used now as the basis of the scientific discoveries made today. They say every artist paints or draws in their own perspective, so there may be a huge possibility that in different paintings of the same molecule or cell we could appreciate the angle of the scientist. Some could have given more emphasize to what they had observed with more attention, while others would give more importance to what for them was more interesting. Nevertheless, we should also appreciate what technology has given us. Scientist now can go more deeply than Robert Hook could have gone. We can infer that if Robert Hook had the tools scientist have today in labs, there is a possibility that the science field today could have been even more advanced than what it already is. It has only past 300 years since the invention of the microscope, maybe when today’s generation reaches their scientific years, they will see our technology as we see the first microscope. Great post. I never knew such common paintings had any relevance to scientific research. Science doesn’t only influence its subjects, but also its receptors. These receptors (people) are influenced through the media. And, reading this post, I realized something very obvious: science’s easiest way to influence most people is through the media! We’ve been influenced and involved in this process unconsciously throughout all of our Biology class this year, since we’ve been seeing images, videos, documentaries, and movies all explaining an aspect of scientific research, especially during this chapter of the cell. In fact, this very blog is the result of science influencing the media! Who would think of it that way? I agree! Another medium that influences scientists a lot: literature. And cinema, especially science fiction literature, and science fiction cinema. In fact, I’m willing to bet that astronauts in the 60’s and 70’s were influenced by Star Strek. At the beginning of this school year we studied how biology affects our every day lives. I remember thinking that if it weren’t for science (especially biology), we wouldn’t have as much knowledge of the living world as we have today, but by reading about Robert Hooke’s drawings of the cell another thing came to my mind. Not only has biology influenced our growing knowledge but it has also influenced the way in which we express ourselves artistically, though art, music, and dance. The way it influences art is shown in the pictures on the blog post. An example of the way it influences music is the song we heard called “Virus” on the classroom the other day. And finally there have been many interpretive dances done that simulate the movements of cells and other micro organisms. Biology is a big part of our lives. Before discussing the chapter and visiting this blog I was unaware on how important art was for science. I knew scientist had to be creative and use their imagination but I didn’t know science and art influenced each other so much. Hooke was able to draw what he saw. Long ago scientist were artists and artists were scientists. Art helped understand science. They influence each other which lead to amazing pieces of arts and great discoveries. I believe if all scientists know a days were artists we (the students) would be able to understand science better and have a greater knowledge on how living-things work. At the same time art would become more diverse. Whatever artistic talents we have, they should be nourished; they enrich not only our careers and academic aspirations, but also our lives. In 400 years humans have been able to explore the human cell pretty well, but the world is infinitely small and I imagine that in 400 more years a lot more parts and a lot of other different kind of cells could be seen. In 400 years scientist have found about 20 organelles in the human cell, imagine all those other parts that can not be seen because they are too small for the present-day technology. Many of us do not realize the important place art has in science (and vice-versa) and not just the use of paintings but also literature. Interpreting science sometimes cannot be taken literally and that’s when art comes in to place. I found this article where it is questions if art is the future of science, talks about the special role it plays and some art movements that inspired scientists. This is an article that I will enjoy immensely. Thanks for sharing it, Frances. It is really interesting to know how Robert Hooke came to the discovery of the cell. The assignment of doing microscopical searches was for Christopher Wren but he gave up the project and Hooke took the assignment for him. Robert Hook’s technical abilities allowed him to control the height, angle, and illumination of the microscope which lead to the discovery of many details that could not be seen with plane sight. Hooke came to discovering the cell after observing the “pores” (cells) of a cork. Check out a free, online, copy of Micrographia, or, Some physiological descriptions of minute bodies made by magnifying glasses with observations and inquiries thereupon. This book sparked a scientific revolution; one of many. Hooke and other scientists of that time did not have the proper equipment or technology to develop a clear image for the world to see what they were discovering through their new lenses and microscopes. The only option was to draw what they saw. Since it was a new world, it became art instantly. I never imagined that art was so important in science. It is a shame that the concept of renaissance men has been lost over the years. It is evident that Robert Hooke was a brilliant individual who we know as the man who first observed cells. Not only was he a diligent, hard working scientist, he was also an amazing artist. His book Micrographia is actually a pretty cool and interesting read since it does not only offer descriptions of his observations, but also really detailed drawings of what he observed, which are exceptional drawings at that. It wasn’t so easy back then since now we have high techy-type technology that takes pictures for us. I agree. A lot has been lost with our hyper-technological dependency. But we have to be careful and not fall in a trap all too common: the luddite trap–a luddite being “a term describing those opposed to, or slow to adopt or incorporate into their lifestyle, industrialisation, automation, computerisation or new technologies in general.” I suggest you do some research on the concept; which is very prescient in contemporary thought. Our context is highly technological. And proper thought our relationship with science, technology, and art is very important. It is really interesting to know how Robert Hooke came to the discovery of the cell and how art influence with science. Albrecht Dürer has influenced a lot with science and art with his cartographic and anatomical work. He was the first to do a perspectival rendering of a terrestrial hemisphere. here is more information about him and what he did. Art is a very important part of science. Without art we wouldn’t understand science as well as we do nowadays. When you read something in your science book and you don’t understand it you always look for a figure or a model to help you visualize it and picture it more clearly. ‘It’s necessary but not sufficient’ to focus on science, technology, engineering, and math (STEM), says Larry Thompson, president of Ringling College of Art and Design in Sarasota, Fla. ‘You don’t go anywhere with STEM if you don’t have STEAM – and that’s [adding “A” for] the arts, the creative part. It amazes me how accurately these scientists drew/painted the things they saw, and I also like how the drawings aren’t that complex yet so informative. I would never have thought that scientists could be such great artists. I would like to see a modern scientist’s interpretation of their observations, since they mostly use computer made images or models to show their observations and data; I would imagine it to be very informative. Here is a link to a picture I found of a page in a 11th-12th century book. When an artist wants to show his owns opinions he will create a piece proving these feelings and opinions. Just as when a scientist thinks he has the potential to find something new, he will create an experiment around that thought he had, in order to prove his point. But when these two clash, we get to see the most beautiful masterpiece ever created. We get to see how an artist tries to prove a scientific point through the work of sculpting, painting, ext. with his scientific insight on the specific subject. All they both ever want is the acknowledgement of their points from those around them. When a scientific artist makes the people around him think deeply about his piece, then he has finally accomplished the true meaning of art and science. This is how we see two very different subjects in life seem like they came from the same branch. Here is an online journal (with its own blog) where art and science clash together. Searching in the blog I specially loved Vince McKelvie’s 3D .gifs, because he has a similar opinion on gifs from that opinion of the joining from art and science. He sees gifs as a modern art, just as scientific art is. I also liked very much Julia Buntaine’s art work because we can see how she could join her opinions on science, art, and the social media, all in one art piece, seen in her brain-city sculptures. Great links, Marie. 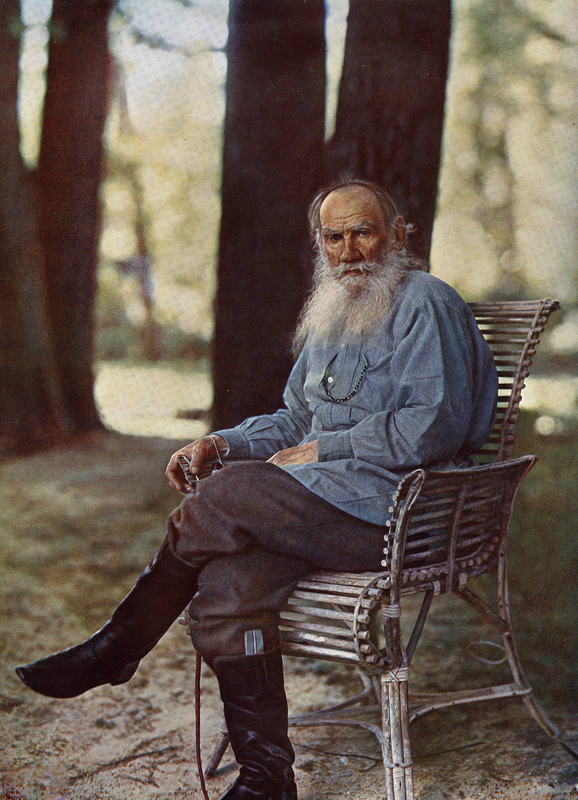 And kudos on quoting Tolstoy. This blog post states, that Robert Hooke discovered the cell by using a microscope. Without his imagination and creativity of putting a piece of cork under a microscope, we wouldn’t be able to know the different types of cells and the variety of cells that exist, since people only used the microscopes to verify if the silk fabric was real or not. 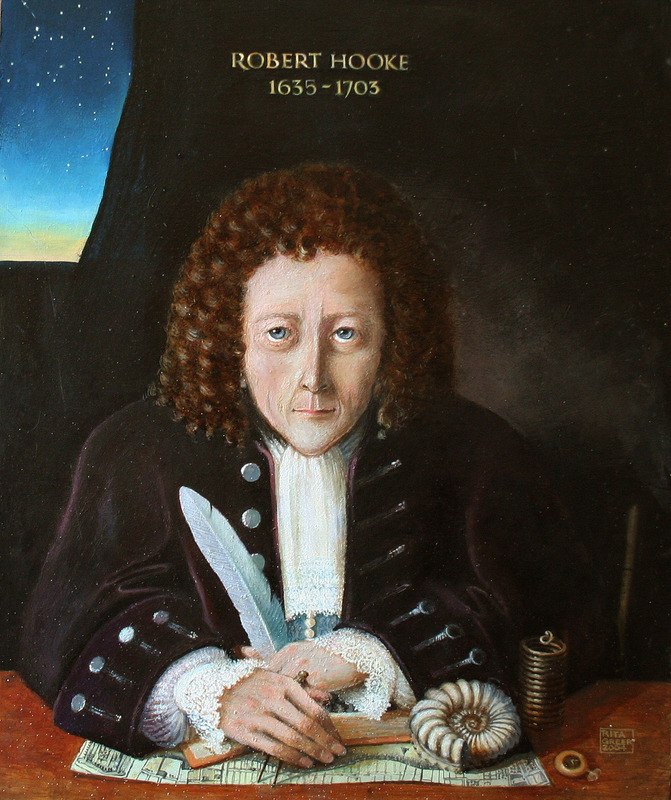 In his investigation, Robert Hooke had to record all of his findings in order to show them to the scientific community. He did this through drawings or art. As I said in one of my blog posts referring to this one, art and science are co-dependent, interdependent and it allows us to view things from a different and varied perspective. Furthermore, I see the connection between art and science in how Albert Einstein used music in order to understand science. One can’t think of science as alienated from art, for they are disciplines that interconnect. When seeing all of the different pictures of paintings you posted on the blog there was one in particular that caught my eye. I remember in class you asking what we thought each painting showed or represented related to biology, I remember in the second painting I said that the painting looked as if it was telling a story. And that is what biology and art combined do together, it tells a story with a beginning as small as an atom and as big as the universe. When researching for more pictures of how science is reflected in art, I came across a molecular geneticist, photographer, and award-winning microscopist called Dr. Fernan Federici. He works with microbial and plant systems, and is an expert in high-throughput DNA circuit assembly and cellular imaging. When I saw his photographs (images) I was astounded as to what technology and cameras nowadays in the 21st century can achieve. 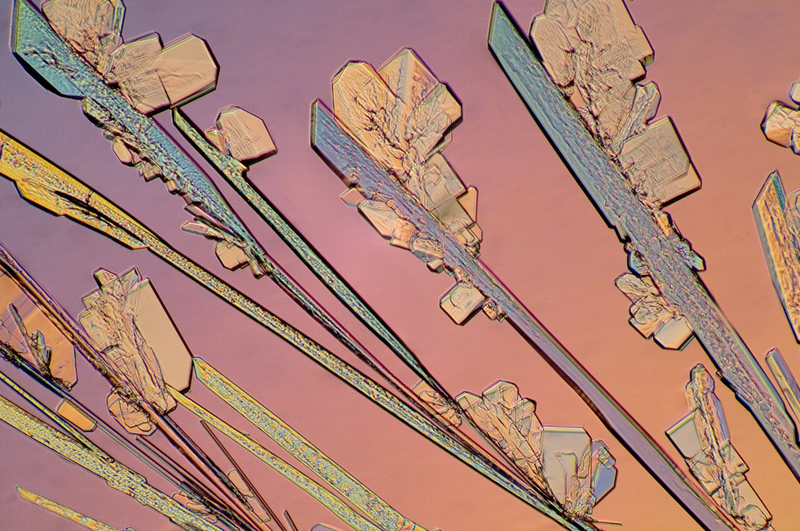 His microscopic images are perfect examples of how we can find art in unexpected places. Here is the link of the photographs of Dr. Fernan Fedirici. Microscopy and photography are quite trendy in today’s cross-pollination of art and science. I just wonder if these images where easy to identify back then I mean I’m sure they had to explain what was what but apart from that i find it wonderful how they portrayed each part of a cell into art and that just shows how art plays a roll in science too. I liked the sense of creativity and i just think that it could be cool and a good idea to create a cell structure for a bio lab like Robert Hook did. I believe that the paintings and drawings in this post are incredible. i sure hope they are about cells and molecules instead of other beings of other worlds. These paintings are probably people trying to imitate the things they saw in microscopes, but not exactly what scientists saw. People think that these paintings represent cells and molecules, but what if these paintings are just a casuality that they look like these? It is truly fascinating how art and science overlap and looking into the history of any science I realized what a huge impact art has made in science and vice versa. Both are means of investigation. Both involve ideas and theories that are tested in places where mind and hand come together. Scientists and artists study people, materials, culture, history, technology and technique. One of the most famous examples of a person who brings these two elements together is Leonardo Da Vinci. He observed the world, studied physiology and anatomy to have a more accurate representation of human gesture and expression. In the late-19th century, the physiological, psychological, and phenomenal effects of color and light were of very important to Impressionist and Post-Impressionist artists such as Vincent van Gogh and Claude Monet. Monet suggested that our sense of our physical environment changes continuously with our shifting perceptions of light and color. It seems that the next few years promise a cognitive revolution in terms of what we think about science and art. Here’s the article: fMRI Study Reveals Differences in Brain Response to Poetry and Prose. Can you imagine how much wonder and curiosity Hooke might have experienced when discovering such odd figures inside a thin piece of cork. If it weren’t because of Hooke and microscopy advances this extraordinary discovery wouldn’t have happened. Science and art naturally overlap. I believe science can inform the creation of art and that art can be used to bring scientific concepts to non-scientific audiences. There are so many people inspired by both art and science, including myself. These inspirations lead to beautiful and complex creations, such as the paintings shown in previous comments. WOW, this made me think about art in science, at first I thought it was hard and could end up being boring which motivated me to look for other sources of the bind of science with art. The results where better than I expected. I gpt to watch a short presentation of this type of art made by Fabian Oefner. This particular photographer decided to make modern art with science, the outcome of his project is awesome! This is the link to the video that shows Fabian Oefner’s work with pictures and explanations. Oefner is a great artist. Aurora No.1 is one of his most impressive pieces. His work is a great example of the nexus between art and science. I love this post because i am a very artistic person. I love to see how people can transmit their toughts and visions in a piece of paper and this way make it posible for us to see and understand. I personally am a very visual person, i understand things better when i see them. For that reason i appreciate Robert Hooke very much, he made science easier for me to understand and i am sure he made it easier for many other people as well. Art is a very important part of the human experience; it cannot be ignored, especially in the context of science. I found this post to be amazing, because through it, we could see how something and art and science (biology) can be so related. Art was and continues to be extremely important for biology, because if it weren’t for art, scientist would not have been able to demonstrate their visual representations of the discoveries that they made hundreds of years ago. Art is extremely vital for biology, and it is amazing to see how these two fields overlap each other, which is something that I would not have thought of if it weren’t for this post. Many people believe art and science are totally unrelated, but they connect in many ways. This blog made me realize that maybe they aren’t so different after all. I think art and science are “fraternal twins”. In both, imagination and the need to explore are necessary; yet most art comes from the individual while science is about the Universe and everything in it. Art and science rely on each other. An artistic drawing can explain what a cell and it’s organelles or planets and stars look like. An artist might use scientific knowledge to create a technique that perfects a detail in his/her work. Many things are art museum worthy, and science is one of them. I agree. A lot of artists and scientists are aware of the many things they have in common.